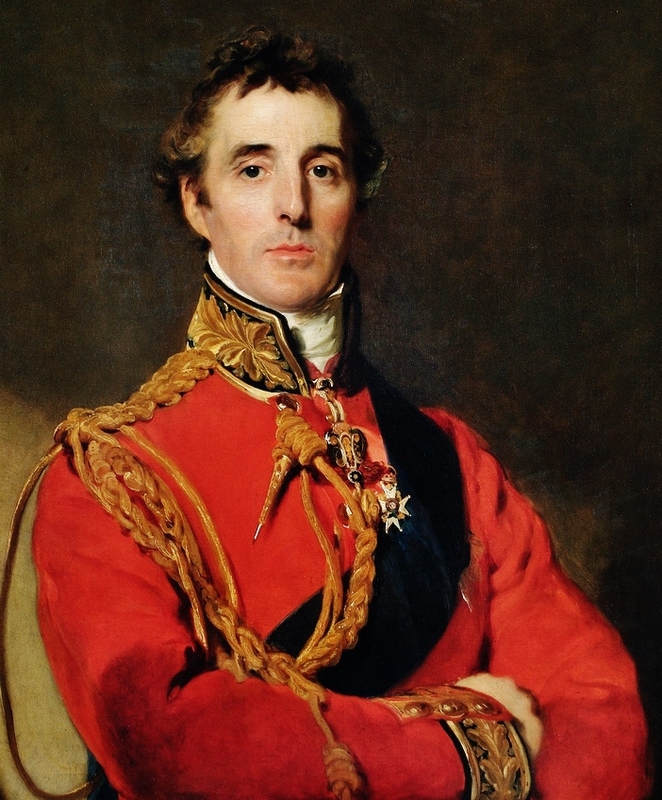 The Duke of Wellington’s Regiment was the only Regiment in the British Army to be named after an individual who was not part of the Royal Family. In 1806 Wellesley succeeded the Marquis Cornwallis as Colonel of the 33rd and held that appointment until 1813. On 18th June 1815 the famous battle of Waterloo was fought, which led to the final defeat of Napoleon and confirmation of the Duke of Wellington as one of Britain’s greatest military commanders. He died in September 1852, aged 83. The following year the 33rd was granted the title: The 33rd (or The Duke of Wellington’s) Regiment, by Queen Victoria, due to his long association with the Regiment, thus becoming the only regiment in the British Army to be named after a commoner. 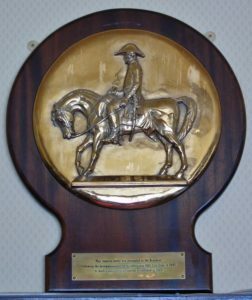 The Duke’s descendants maintained close links with the Regiment. Notably, in 1935 the Earl of Mornington, the only son of the 5th Duke, was commissioned into the Regiment. In 1941 he succeeded to the title, as the 6th Duke, but was killed in action in 1942, whilst attached to the Commandos at Salerno, Italy. 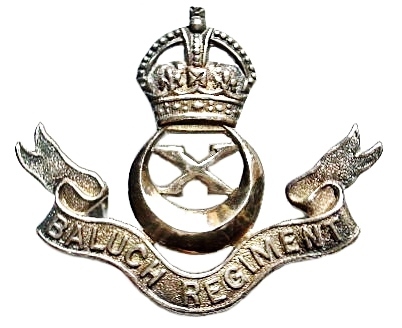 The 8th Duke was appointed Colonel of The Regiment in 1974. He was the only non-Royal Colonel of a Regiment in the British Army. The ‘Dukes’ were the only Regiment in the British Army to carry four Colours on parade. The first pair being the Regulation Queens Colour and the Regulation Regimental Colour, which all regiments carry. 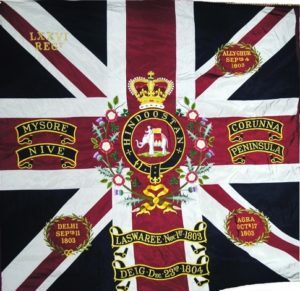 In adddition to these the Regiment had two Honorary ‘Battle’ Colours; the Honorary Queens Colour and The Honorary Regimental Colour, both of which are of the original size of 6′ 6″ by 6′ 6″. Regulation Colour sizes are 3′ 9″ by 3′, and differ little to the design laid down by King George II. 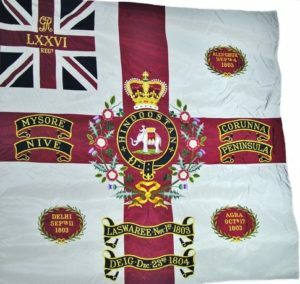 These Honorary Colours were originally awarded to the 76th Regiment, in 1808, by the Honorable East India Company, for their distinguished services in India, during 1803-1804, at the capture of the Fortress of ‘Ally Ghur’ and the capture of ‘Delhi’. 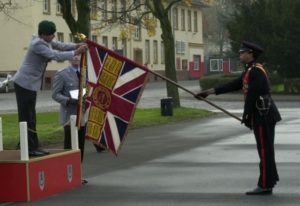 Following the amalgamation of ‘The Dukes’ into The Yorkshire Regiment, as the 3rd Battalion, the Honorary Colours were taken forward and carried when the battalion was on parade. The Queens Colour has the Union Flag, whilst the Regimental Colour has the English Flag. Common to both the 33rd and the 76th Regiments were the rare ‘Red Facings’, linings, to their uniforms. This unusual distinction continued in modern times by the use of a red backing to the Cap Badge and the use of red lanyards by Officers, Warrant Officers and Sergeants, and red sashes by Sergeants and Warrant Officers. The cap Badge was the crest of the Duke of Wellington; A Lion Rampant, carrying a Banner Unfurled, within a crown, below which is a crest bearing the words “Virtutis Fortuna Comes” – translated as “Fortune Favours The Brave”. Below this is a Scroll bearing the words “West Riding”. 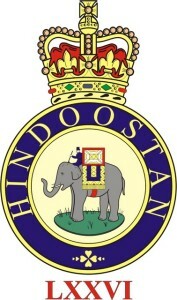 The Badge of an elephant, to which a Howdah was later added, circumscribed with the words “HINDOOSTAN” was granted to the 76th at the same time as the Honorary Colours. 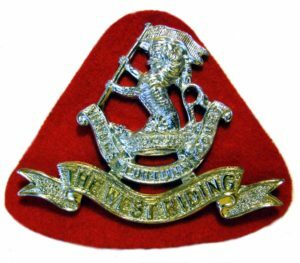 The Elephant became the Collar Badge of the Regiment, following the merger of the 33rd and 76th Regiments. It also became the design displayed on the Regimental Buttons of various uniforms. Such as No.1 Dress (Blues), No.2 Dress and No.6 Dress. Canada: – Les Voltigeurs de Quebec. Royal Navy: – HMS Iron Duke. On the 24th of November 2005, in Osnabruck, Germany, Major General Clauss, General Officer Commanding 7 Panzer Division, on behalf of the German Federal Minister of Defence, awarded a ‘Bundeswhehr Fahnenband’ to the Regiment. The Fahnenband is a prestigious German military distinction, in the national colours of Red, Black and Gold. It is regarded in the same way as Regimental Colours. It was attached to the Regulation Regimental Queens Colour. The Fahnenband is only awarded to allied units and formations, of Battalion or greater size, which leave the the Federal Republic of Germany after a period of five or more years of service, in recognition of their service in Germany. The front is inscribed with the words “Einsatz Fur Frieden und Freiheit” (Commitment to Peace and Freedom), whilst the reverse has “Bundesrepublik Deutshland 2005”.